It felt good to hit the trail this weekend after taking a few weeks off. For 2015, I completed the 52 Hike Challenge and covered more than 800 miles in the process. Setting a goal of 52 hikes for the year really forced me to get out and explore. It was pretty difficult at times, and a challenge to stay motivated, but looking back, it was my greatest year of outdoor adventures. For this reason, I’m excited to be picking up where I left off, and am setting out to complete another 52 hikes for 2016. 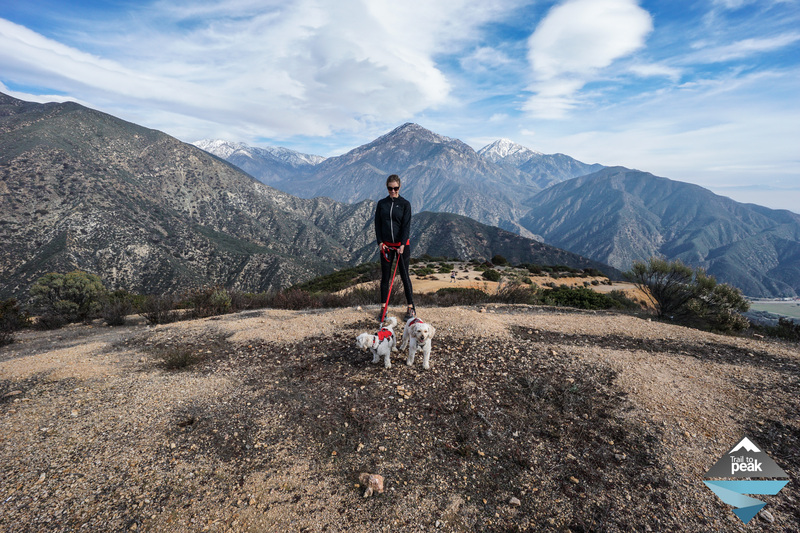 To get started, I took Julia, Isla, and Lilly to Evey Canyon to hike Potato Mountain. We usually hike to Potato Mountain via Claremont Wilderness Park, but opted for this new route to give ourselves a new challenge. This hike is 4.4 miles roundtrip with 1150ft of elevation gain to the 3,360ft summit of Potato Mountain. The trailhead for Evey Canyon is right off of Mt. Baldy Rd, with parking available on small dirt strips. We’ve passed this trailhead on our way up to Mt. Baldy countless times, and have always wanted to try it, but our eyes were always drawn towards the higher mountains. The beautiful thing about Evey Canyon and Potato Mountain, is that you have views of Cucamonga Peak, Ontario Peak, and Mt. Baldy that aren’t available anywhere else. These views are especially incredible at the moment with all of the peaks covered in snow. I’m feeling the urge to get back out on those peaks to enjoy some of that snow before the warm weather comes back to melt it all away. The Evey Canyon trail starts with a slight downhill before climbing up through a canopy of trees on a wide dirt path. There are no junctions or side trails, so navigation is as easy as it gets. A creek runs alongside the trail for nearly the first mile. It was cool, so the bugs weren’t a factor, but if you’re hiking this trail on a warmer day, come prepared. The first and only trail junction for this hike is where the Evey Canyon trail meets up with the trail from Claremont Wilderness Park. Coming from Evey Canyon, the trail makes a u-turn and climbs steeply towards the summit of Potato Mountain. From this point on, the views of the San Gabriel mountains are quite spectacular. The final half mile of the 2.2 mile hike to the summit is the steepest and most beautiful of this entire hike. What made it even more so on this day was that a grey and overcast sky was just beginning to transition to a canvas of blue and white. Isla and Lilly caught sight of another dog, and the sounds of voices up ahead had their legs churning. After almost one hour of hiking, we were standing at the summit of Potato Mountain with views of the Inland Empire, San Gabriels, San Gorgonio Wilderness, and Los Angeles County before us. We took some time feed Isla and Lilly, while taking photos and enjoying the views. After spending about 20 minutes at the summit, we made our way down on the same trail we came up. It was a great way to start the year, and a great start to the 52 Hike Challenge for 2016. Thanks for all of your great hike pictures and blogs! Potato mountain is one of my favorite, quick go-to hikes/runs in Claremont. If you want a nice run that really pushes your cardio and legs to a new level, this is one of them! Stunning views this time of year are a great benefit, and the solitude from a trail less traveled than others nearby make for a fabulous experience. wow!! looks amazing 🙂 would love to to do this hike! Smooth trail with great views! Cheers! I’m sure you know it, but you really are so lucky to have this on your doorstep. wow great pics! I want to head to CA and do this hike myself–to bad I have to shlep to work tomorrow instead! Last picture has an amazing view!! Thanks for sharing! How does potato mountain and Claremont wilderness park compare in hike difficulty? They’re about the same. Both are on wide fire roads. CWP is a mile longer, but that’s really the only difference. The end of Potato Mountain has a pretty steep section, but it’s not too bad.